Смирнова Е. И., Грицких О. Ю., Дмитриенко Н. А. Classification of modern dishwashers // Молодой ученый.  2015.  №2.  С. 198-201.  URL https://moluch.ru/archive/82/14696/ (дата обращения: 22.04.2019). Dish washing, including household usage, is one of the most laborious processes and it takes from 12 to 15 % of the total time spent. The implementation of dishwashers makes people’s every day work much easier and gives them free time, and water and detergent use becomes more efficient. Moreover, machine washing is more hygienic than hand washing . Dishwashers for public catering facilities are classified according to the following features: the purpose of using, the operating cycle structure, the organization of the working chamber and working bodies (Fig. 1) [1, 2]. According to the purpose catering machines are divided into universal — designed to cleanse multiple types of utensils (plates of all sizes, etc.) and special — designed to cleanse only one type of utensils (glasses, cutlery, etc.). According to the working cycle structure machines are considered to be batch and continuous action. The peculiarity of continuous action machines is the continuity of the dirty dishes uploading, processing (completing of all washing operations) and clean dishes unloading. In this case, all dishes are transferred along the beltline through several sections of the working chamber and are consistently undergone all operations. Dishwashers of continuous action are produced for dishes, cups, glasses, trays and utensils sanitation [1, 2]. The peculiarity of batch action machines is the operation’s periodicity, consisting of three sequential operations: uploading, processing (washing) and clean dishes unloading. According to the working chamber organization machines are divided into chambered and open. According to the working bodies organization machines are divided into hydraulic and hydro-mechanical. Hydraulic (shower) dishwasher operations are based on hydraulic large impact of high warm and hot water rate for dishes washing. In this process flowing waters or recirculating water (with the use of rotary vane pumps). Hydro-mechanical dishwasher operations are based on the simultaneous-hydraulic and mechanical impact on the utensils. The dishes are washed by brush surfaces (brushes), wetted with flowing water, with cleaning and disinfecting solutions. At present time the production of sectional dishwashers is being developed. 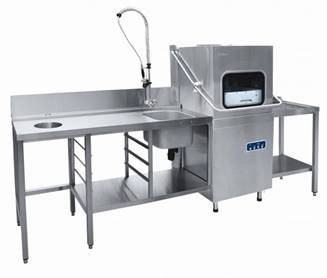 Sectional ribbon dishwashers perfectly meet technological and operational requirements of public catering facilities. Currently, the range of sectional ribbon dishwashers with productivity from 1000 to 11 200 plates per hour is manufactured. It is suggested to produce sectional dishwashers in four versions: right-turning; left-turning; right-turning with dryer; left-turning with dryer. In right-turning machines conveyor bed moves from left to right across the work front, in left-turning machines — contrariwise. In accordance with GOST 30147–95  home dishwasher carries out rinsing and drying (if drying provided) of chinaware, delftware and glassware, cutlery and, in some cases, kitchenware chemically, mechanically or electrically. Modern manufacturers produce a great variety of home dishwasher represented on the Russian market different firms: Bosch, Electrolux, Zanussi, Candy and Siemens, Beko, etc. . Full-sized home dishwashers (Fig. 2.a) are designed for washing of 12–14 utensils sets, and they are suitable for a family consisting of 5 or more people. In fact, it is assumed that one set of dishes includes 11 pieces for a person having dinner, such as: three plates with different size and purpose, glasses, a cup and a saucer, a knife, a fork and three spoons. Dimensional specifications: height is 85cm, width is 60cm, and depth is 57 cm. Machines of this class are available in floor-standing version . Narrow home dishwashers (Fig. 2. b) are designed for washing of 8–9 dish sets and they are suited for a family of 3–5 people. The width of a dishwasher is 45cm. These machines take far less space and fit well into the small kitchens. 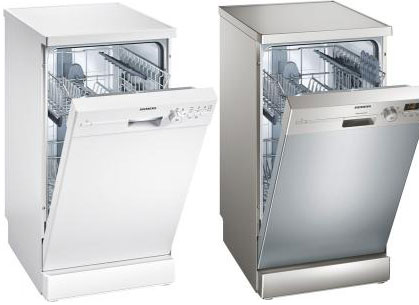 Narrow home dishwashers are divided into free-standing and embedded; there are no functional and technical differences. Embedded dishwashers are subdivided into two groups according to the type of embedding and doors hanging: a) with an open panel when the control panel and the display are at the front, at the top, and the facade is attached below it; b) fully embedded, when the control panel is at the cross-cut end of the door. Such models are the most prevailing among the narrow dishwashers, functions setting is held only when the door is open. Compact home dishwashers (Fig. 3. c.) are designed for 4–6 sets of dishes. Their width is 45–55 cm, depth is 48–55 cm, height is 45–46 cm, although it fulfils its functions perfectly. Compact machines can be installed on a desktop or can be hidden in the kitchen drawer, in this case, the hoses’ filler piece should be provided (for drain hose and filling hose) through the tabletop, and in some cases, through the drawer itself. It is not recommended to embed it into a wall hanging kitchen cupboard because the machine depth of 55cm makes the cupboard deformed. It is suitable only in case of limited space for installation. These machines are appropriate for families of 2–3 people, for bachelors. They are easy to transport to the countryside. Remember that they are less efficient and the washing quality is lower than that of immobile machines . The advantage of embedded dishwasher (Fig. 3) is that they can perfectly blend with the interior of your kitchen furniture — the same façade door (as on the other pieces of furniture) is hinged on the dishwasher’s front panel. Definitely, you can install a free-standing dishwasher (Fig. 4) into the kitchen furniture drawer. In this case, only the front side of the machine is visible. Some models are provided with a removable top panel, due to a dishwasher easily fit under a desktop of standard height. The most important are economic factors. Depending on the degree of resource (water, electricity) saving dishwashers can be subdivided into several classes from A to G. A class is the most saving. For instance: the most economically efficient dishwashers spend 14–16 liters of water in one dishwashing cycle. Less saving machines spend more than 25 liters of water. We might add that on average 60 liters of water are spent at hand washing. Pay attention to the functional characteristics of dishwashing machines. You can find machines with 2–12 wash modes, however, only four modes of washing the most commonly used. Modern dishwashing machines, besides the main modes, often possess the saving mode of washing for slightly dirty utensils; it reduces the water consumption as well as electricity consumption. Some dishwashers are provided with a mode of washing options division; it allows washing fragile and heavily dirty dishes at the same time. Bio mode is also interesting, it is designed for dishwashing with abstergents on the basis of enzymes. In accordance with the performing analysis of modern dishwashers for for public catering facilities and home dishwashers, the dishwashers classification is depicted in figure 5. Thus, in this paper we propose a new approach to the classification of home and domestic dishwashers, as far as in modern literature, the classification has not been previously introduced. 1. Cooper, ES, Krawcewicz, VJ Modern household appliances and mashiny.- M.: Mechanical Engineering, 1987–224 p.
2. GOST 14227–97 2. Dish-washing machines. General specifications. — Enter. 01.07.1998. — M.: IEC Publ Standards, 1998. — 12 p.
3. GOST 30147–95 3. (IEC 436–81) Dish-washing machines for household use. Methods for measuring performance. — Enter. 2000–01–01. — M.: IEC Publ Standards, 1999. — 19 p.
Основные термины (генерируются автоматически): GOST, IEC. Европейские стандарты (EN) для проектирования сооружений, зданий и строительной продукции разрабатываются CEN на основе международных стандартов ISO и IEC. This article is devoted to research of basic standards used for cryptographic modules. Features and sections of standards are considered. At the end of the article provides a brief conclusion. Информационная технология — Методы и средства обеспечения безопасности — Менеджмент риска информационной безопасности ISO/IEC 27 000 [Электронный ресурс].